The Israeli prime minister’s office has said that he was “misquoted” in the article, and said that he meant individual Poles. POLISH PRIME MINISTER Mateusz Morawiecki has cancelled a visit to Israel for a high-level summit, a government spokesperson told AFP, after uproar in Poland over reported comments by Israeli leader Benjamin Netanyahu about the Poles and the Holocaust. Netanyahu – who was initially quoted in Haaretz newspaper as saying that “the Poles collaborated with the Nazis” – has been condemned in Poland for appearing to accuse all Polish people of cooperating with Germany during World War II. Warsaw has long been at pains to point out that Poland, which was occupied by Nazi Germany, could not have and did not collaborate in the Holocaust although individual Poles may have done so. “Paying an unimaginable price, the Polish nation never went to collaboration with Germany Nazi. We stood on the side of good against absolute evil,” Morawiecki said on Twitter. The Israeli prime minister’s office has said Netanyahu did not implicate all Poles in the Holocaust. It insisted that Netanyahu was “misquoted” in Haaretz and other publications that reported different versions of the quote. “Netanyahu spoke of Poles and not the Polish people or the country of Poland,” a statement read. Morawiecki will no longer attend the Visegrad Group summit, a diplomatic meeting of central European nations, in Jerusalem this week. “Prime Minister Morawiecki told Prime Minister Netanyahu in a telephone call that Poland will be represented at the summit by Foreign Minister Jacek Czaputowicz,” government spokesperson Joanna Kopcinska said. “Questions about the historical truth and sacrifice that Poland paid during the Second World War have a fundamental value for Poland,” she added. 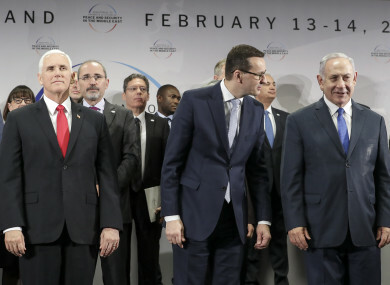 Netanyahu was in Warsaw last week for a two-day summit on the Middle East, co-hosted by Poland and the United States, which focused on isolating Iran while building Arab-Israeli ties. The fresh controversy in Polish-Israeli ties comes after last year’s row over a Polish law that made it illegal to accuse the Polish nation or state of complicity in Nazi German crimes. After protests from Israel and the US, Poland amended the law to remove the possibility of fines or a prison sentence. Poland was occupied by Nazi Germany during World War II and lost six million citizens including three million Jews. Email “Polish PM cancels Israel trip after reports of Netanyahu saying 'Poles collaborated with Nazis'”. Feedback on “Polish PM cancels Israel trip after reports of Netanyahu saying 'Poles collaborated with Nazis'”.